The whole world is talking about the demographic dividend that the countries like Bharat and China have. It is expected that the largest population of the employable youth in the whole world will be concentrated in Bharat. Though china has almost one and half times more populated than Bharat, the population in the youth age group is reducing due to the stringent population control measures china adopted in the second half of last century. The other aspect of the demographic dividend is that the employability of the young population. Here comes the role of education. As we know for last one year the US president Barak Hussain Obama has been warning the Americans about the Bharatiya youth taking their jobs. He talked about the the education of Bharat being more superior to the US. And has repeatedly asked the US universities to gear up to compete with Bhartiya institutes of higher learning. These were more warnings to their education rather than praise for our educational system. They have changed their visa policy to safeguard the jobs from Bharatiya immigrants. He topped it all in his visit to the school in Mumbai where he declared that the day was not far when Americans will start coming to Bharat for learning. This is nothing new. We all know that there were times when the whole world used to come here for learning. Till the first part of the 19th century we had well spread educational system. All were given free primary education. Irrespective of caste or socio-economic status everyone was given education according to their needs. Prof Dharmpal has brought out the report of a survey done by the British collectors and submitted to the Privy Council in 1823. http://www.samanvaya.com/dharampal/ When we read that report we are surprised to know that the so called backward class was also fully educated and their were teachers abound from these sections/castes. So this was the state of our nation not in the distant history but just a 200 hundred years. Prof Dharampal says that the educational system in Bharat inspired the spread of primary education first in Briton and then in whole of Europe. So these are the two facts about Bharat’s educational supremacy in the whole world. But do we feel proud of our education today. Even if Obama may shout on the top of his voice there would hardly be anyone in Bharat who is satisfied with the condition of either our schooling or the higher education. There are articles in the media, surveys and also the day to day experience of most of us that all is not well in our educational system. Why this difference of perception. Obama sees Bharatiya Educational System as threat and we consider the same system rotten. We have passed a bill in the parliament to invite foreign universities to start their campus here. The worst part of the bill is that the language is that of an inferior country. The same act could have been phrased realistically if the drafting law officer of the HRD ministry had little pride in the nation. Again it the failure of the educational system that the well educated civil servant of such seniority lacks national pride. We are not satisfied with our existing educational system because somewhere deep within unknowingly we feel that it is not rooted in our own past. It is not our educational system. It is not Bharatiya. We may not on the face of it understand what constitutes this Bhartiyata. But we feel it. We have a sense of it. This Bhartiyata has to reflect itself in all the walks of life. In all the socio-economic-political systems of our modern nation. This is the real nation building that needs to be attended to. How to go about it. We have to first understand our own system. Here we are talking about the education so let us try to understand what are principles on which such a system was created which could provide education to all even in the 19th century, after so many invasions and foreign rule for more than a millennium. Swami Vivekananda says that if you do not have pride in your own history you will not be able to create a bright future. He says standing on the firm foundation of the past only you will be able to look into the future. So one of the easiest way to understand the Bharatiya National educational system is to understand our great teachers. The one name that stands out bright in the history of great teachers is Chanakya. The teacher of the great university of Takshashila (now in Afghanistan) who created a great Maurya empire. A teacher could create such student and such system which would integrate the whole nation. The backdrop is the brutal attack of the Great(?) Alexander. He brutally attacks the civilized Bharatiya principalities and republics. But has to return accepting defeat at the hands of the unorganized but inspired force of common mass of the great Bharat. But the teacher is not happy. Chanakya sees this as a challenge to this great civilization. Which with all it economic prosperity and ideal social order, great knowledge of the spiritual and the physical; this nation has failed in creating a strong political system which could protect its bounty and the righteous masses. Chanakya understood the need of the hour to create an example of strong state mechanism based on the universal principles of existence called as laws of being( Dharma) traditionally. So he creates a leader in the form of Chandragupta and dedicated team of his associates and then conquers the greatest empire of the time Magadha and establishes the common umbrella of a chakravarty to protect the individuality of the diversity of expression of the inherent unity. We all know the story, so let us try to understand the concept, what makes Chanakya the great teacher. So that we can create such nation building teachers even today. Pride of being Teacher : Chanakya is a proud teacher. HE understands the creative power of the teacher hence is not afraid of the king. He challenges the King of Takshashila when Ambhi decides to side with the invader. He is apt in replying the Magadha Emperor Dhananand – A teacher does not beg, he creates. He has the capacity to create the emperors. This confidence is the backbone of Chanakya. When he did not have any one with him, any material support even then he is confident of success of his plan. The National character : This pride and confidence was not the product of individual achievement but was deep-rooted in the national pride. Chanakya had firm faith in the timeless (Sanatan) principle of Bharatiya jivan. He had practiced it in his own life and realized the truth of it. This adherence to the Dharma had created the selfless goal of national reconstruction. He knew that this is the purpose of his being a teacher to apply these universal principles to the present time. His goal was not personal as misinterpreted in some history books. It was not revenge of the individual insult but a correction of the whole political system of self-centric supremacy of the ruler. His aim was to re create a political system sensitive to the need of the time and the plight of the masses. As he explains afterwards in his great treatise “Arthashastra”, a system that delivers best to the Praja (better born). He does not have any personal agenda. This selflessness is the greatest strength of the teacher. He lives and teaches for the sake of the nation. Chanakya has no personal animosity. Hence for the good of the nation he invites, even forces the Nanda Prime minister Katyayana (sometimes referred to as Rakshasa for his strict discipline) to take the prime ministership of Chandragupta. He state in Kautilya’s Arthashastra – to a king (read State) there are no permanent friends or enemies. The National interest dictates the royal relations. He is one of the rare Bharatiya philosopher who understands and also explains the concept of enemy. 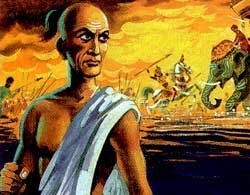 The Team Builder : Chanakya is able to create a great mauryan empire on his strength of team building. He not only trained Chandragupta but also built able and dedicated associates who formed a formidable team. The goal of the team was clear and always remembered by all the team members. Chanakya makes it sure that they do not forget their collective goal in the din & dust of day to day politics. All the team members are clear about their own roles in the grand scheme of things. This was the expertise of the great teacher to understand, encourage and facilitate the realization of the inherent potential of each of his disciples in the best chosen role. Here the individual also expresses his best and at the same time is able to contribute to the collective achievement. This became the basis of the principle of collective decision making and collecting sharing of responsibilities & credit by the council of minister in the ideal political system created by the great Kautilya. Till date collective responsibility of the cabinet is the basis of a successful parliamentary democracy. The Theorizer : the greatness of Chanakya is after creating the empire successfully does not become one of the beneficiary but instead goes to his proverbial hut and chronicles his conclusions into a well bound theory for the posterity to follow. As Swami Vivekananda says, “Life is laboratory for one to explore and experiment.” For Chanakya the nanda conquest and formation of the Maurya empire is but an experiment. He writes the conclusions in the form of the great treatise of Political science, economics and governance : Kautilya’s Arthashastra. Even today it is considered to be great guide in formulating the doctrines and strategies for building a strong State power. Bharat needs to understand Chanakya and follow the principles led down by him if she has to fulfill her destiny. The world is saying that Bharat is not only an emerging power but already super power just she has to proclaim it to the whole world with her OWN voice. Today when all the philosophies are crumbling and the humanity is devoid of any paradigm of a holistic life, Bharat has the onus to provide the sustainable alternative paradigm of world order. Who else but the great teacher Chanakya can be our guide in this hour of reckoning!